For the football player, see Adam Buxton (footballer). Adam Offord Buxton (born 7 June 1969) is an English comedian, writer and actor. He forms one half of the duo Adam and Joe, with filmmaker Joe Cornish. The pair presented Adam and Joe on BBC Radio 6 Music, whilst Buxton also presented his own show on 6 Music on Sundays, called Adam Buxton's Big Mix Tape. In 2012–2013 Buxton presented another radio show for BBC 6 Music, co-hosting with Edith Bowman. When not presenting on radio and television or recording podcasts, Buxton hosts Bug, a humorous exploration of music videos through YouTube comments, which also had a televised version in 2012. He has also guested on various comedy panel shows such as Would I Lie To You?, Never Mind the Buzzcocks and 8 Out of 10 Cats Does Countdown. Buxton's first television appearance was in an episode of Channel 4's Takeover TV, as a man called "Louise" dressed as a Klingon, complaining about Star Trek: The Next Generation being taken off the air. In 1995, he hosted the show itself, and following this he and Joe Cornish, along with World of Wonder, created The Adam and Joe Show for the same channel. It ran for four series. In 1999, The Adam and Joe Book, a spin-off book written by Buxton and Cornish, was published. Buxton co-wrote and acted in the Channel 4 mini-series The Last Chancers, broadcast in December 2004. In 2005 he moved from screen to stage, performing character-driven comedy at the 2005 Edinburgh Festival, with a show entitled "I, Pavel", for which he grew a large beard. He continues to work as a stand-up comedian – appearing primarily at London venues – and still has a beard. His work with Cornish has extended beyond their Channel 4 series, with the pair presenting radio shows on Xfm and later BBC Radio 6 Music, which won a Silver Sony Award for Best Entertainment Programme in 2012. Expanded extracts from the Xfm radio shows have been released as podcasts, which were placed in the UK's top 10 most downloaded. Buxton appeared as a future version of himself in the BBC Two comedy series Time Trumpet, which began a six-part series in August 2006. In 2007, he portrayed journalist Tim Messenger in Edgar Wright's action-comedy film Hot Fuzz. Buxton also appeared in the BBC Three comedy sketch show Rush Hour, which premiered on 19 March 2007. Buxton played many different characters throughout the show. In November 2007, Buxton recorded the video for "Jigsaw Falling into Place" for British band Radiohead, which was the first single from their album In Rainbows. The concept of the video involved each member of the band wearing bicycle helmets with cameras attached, shooting video of the band members' faces. In January 2010, he appeared in the BBC2 comedy The Persuasionists. He has taken part in a number of major films, including his aforementioned performance in Hot Fuzz, as well as appearing in the film Stardust, deputizing for Noel Fielding, who was ill at the time of production. He also featured in the film Son of Rambow as a teacher. He has released a number of popular videos on YouTube, and was commissioned to produce a pilot programme for the BBC based around work of this kind. This was broadcast as MeeBOX on BBC Three in June 2008, but a full series was not commissioned. He also guest starred in the 2011 film "The External World" by David O'Reilly. In July 2012, Buxton appeared in a TV version of his popular tour "Bug" on Sky Atlantic, entitled "Adam Buxton's BUG", Buxton narrated "Francis and Bunty", a short story used to front the 2009 "Best Writer in the Universe" short story competition, on The Story of Egmo podcast. He is also the narrator of some of the titles available on the Ladybird Classic Me Books iPad app, including Goldilocks and the Three Bears and Three Little Pigs. He has since narrated several other titles on the Me Books app such as 'The Great Explorer', 'The Brave Beast' and 'The Lonely Beast' by children's illustrator and author Chris Judge. He also appeared in the Doctor Who audio drama The One Doctor by Big Finish Productions, and has taken other comedy roles on productions for BBC Radio 4. Since September 2015 Buxton has produced The Adam Buxton Podcast in which he talks to other people, usually comedians. The first series went out weekly in 2015 before a Christmas episode with Joe Cornish, in the style of their BBC Radio 6 show. Series 2 commenced in April 2016. Guests have included long-time collaborators Louis Theroux, Joe Cornish and Charlie Brooker, as well as other public figures such as Jon Ronson, Caitlin Moran, Michael Palin and Brian Eno. Buxton was born in London, and spent some of his childhood in Wales. His father was Nigel Buxton, known as a travel writer and wine critic and later to appear on The Adam and Joe Show as "Baaad Dad". His mother is Chilean. Along with Joe Cornish and friend Louis Theroux, Buxton was educated at Windlesham House School and Westminster School. According to an interview with The Guardian newspaper, he attended the University of Warwick for two terms, before dropping out to study sculpture at Cheltenham College of Art, now known as the University of Gloucestershire. Buxton lives near Norwich with his wife, Sarah, and their three children. ^ "Adam Buxton and Edith Bowman: a new double act to warm up weekend winter mornings on 6 Music". BBC. Retrieved 10 October 2012. ^ a b c Greenstreet, Rosanna (13 July 2012). 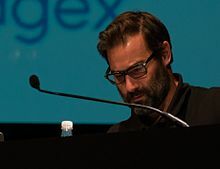 "Interview Q&A: Adam Buxton". The Guardian. Retrieved 4 April 2018. ^ "The Edinburgh festival 2005 – Reviews – Comedy – (A) – 11 out of 91". ^ a b c Salter, Jessica (14 July 2012). "World of Adam Buxton, comedian and actor". The Daily Telegraph. Retrieved 4 April 2018. ^ "Adam Buxton has joined the new series of 'The Crystal Maze'". NME. Retrieved 4 May 2018. ^ Adam and Joe (radio broadcast). BBC Radio 6 Music. 12 September 2009. ^ Hogan, Michael (25 December 2016). "Forget Christmas TV: Adam and Joe's 20th anniversary reunion podcast is the best present you'll get in 2016". The Telegraph. Retrieved 3 June 2017. ^ Hadley Freeman (15 September 2001). "Trivia pursuits". The Guardian. Retrieved 17 September 2009. ^ Keller, David (23 February 2009). "Norfolk home for TV's Adam Buxton". bbc.co.uk. Retrieved 4 April 2018.